While less heavy hitting than All the Presidents Men for example, his focus is still the same but smartly allows somewhat more contemporary plot lines to drive his story as the film goes on. The old school ideas of back stabbers, liars, manipulators and the soulless media amongst the political arena are still showcased however in what is ultimately, a simple, but excellently written work. Clooney is helped by and was lucky enough to assemble a cast to die for, including himself as Governor Morris, an on the surface, seemingly incorruptible nice guy elect until pushed into a corner. Clooney is solid as always moving between likable, threatening and convincing as a presidential candidate (his posters successfully mock the infamous Barrack Obama images). This is not his film however – at least not in the actor sense. I’m not sure what more can be said about Ryan Gosling as his reputation seems to soar these days, but here, playing one half of Morris’s “brains trust”, Stephen, he gives another exceptional lead performance, after coming off the superb genre effort, Drive. As a heavily conflicted character, Gosling is almost hypnotic to watch as his demeanour transforms throughout the film until he reaches the brink of his internal morality battle. On the side you have Paul Giamatti and Phillip Seymour Hoffman. Two of the finest actors of their generation and their great presence on screen are perfect for roles such as this. Though each is given at least one meaty diatribe to sink their teeth into, they do unfortunately appear more in the background, their characters fading out to allow the twists and turns, alongside Gosling’s internal conflict take centre stage. Of the few female roles in Ides, young Evan Rachael Wood, as innocent, but tragic intern, Molly, shines the most. As skilled as she is beautiful, her emotional range is that of someone twice her age. If the film does rely on great performances somewhat to rise it above the norm, that shouldn’t allow to take away from Clooney’s extremely solid execution as director. With the exception of screwball comedy, Leatherheads, all his films have rendered a maturity not often seen in Hollywood, showcased with great style, impeccable editing and pace. Ides, with its shadowy figures in the hallway, extreme close ups and lingering camera moments amongst a subtle, but suitable score, all give the film a classic feel which may allow it (if worthy – time will tell) to sit fairly comfortably next to the 70’s pictures that inspired it. 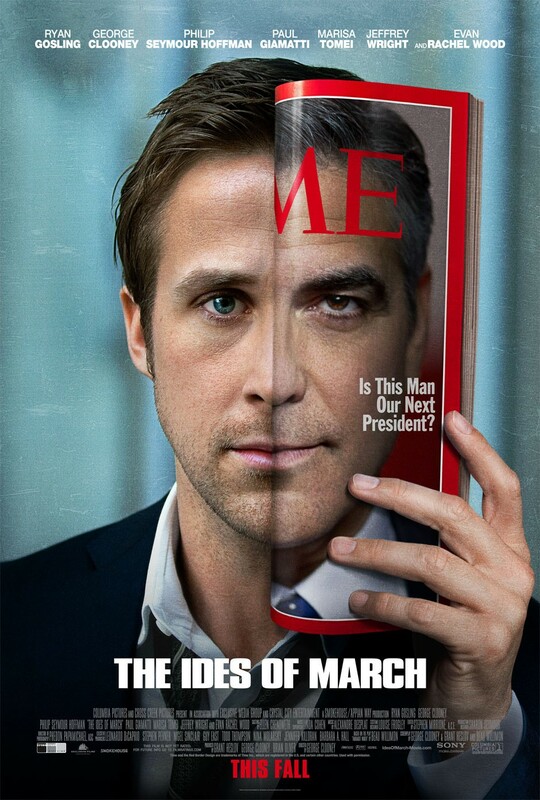 This is perhaps not the film one expected from Clooney, who no doubt will take on the political sub genre again (or we can hope), given the perceived “on the campaign trail” storyline, but that doesn’t make it any less great. Those hoping for Clooney doing The West Wing may be disappointed though. It’s not going to over work your brain in order for you to keep up, but the writing and performances are determined to have you walk away questioning the conflicts at the heart of the story. Perhaps because of this, and like all good movies, it stays with you after the credits roll. Slick, mature and thought-provoking, The Ides of March is one of Hollywood’s best of the year.